This CPU surpasses the 8-core Ryzen’s performance in many applications. Unfortunately, this is achieved at the expense of a stronger overheating. Intel Coffee Lake Core i7-8700K is the ultimate processor for gamers. While its predecessor, Kaby Lake Core i7-7700K, simply boasted of a higher clock speed, the 8700K comes with 6 cores, 12 threads and a powerful, 4.7 GHz clock frequency boost, which is Intel’s fastest built-in boost. This processor copes with its tasks surprisingly well since its clock speed makes up for the lack of two additional cores the AMD Ryzen 7 has. But that’s not all yet. Just like Intel’s Skylake-X i9 processors, the 8700K is to provide keen and tough competition to the resurgent AMD and fill the empty space left by the already obsolete 10nm Cannon Lake processors. Achieving such a clock frequency with 6 cores requires a greater energy consumption, which lead to quick overheating. Although it’s based on the Skylake architecture, the Coffee Lake processor requires a new motherboard, which means greater financial expenses. The 8700K is undoubtedly great. You should definitely get it if you want to build a top-level gaming system with a high-performance GPU. With that, having exceeded the performance results of its temporary substitute, the Coffee Lake has successfully filled the gap that Intel created by hastily transitioning to the era of high-frequency processors. When they created the Coffee Lake CPU, it was an effort to minimize losses rather than a victory over the competitors. The additional cores are the main advantage of the newcomer processors. It’s not clear whether we should thank the Ryzen or this was Intel’s plan in the first place, but the Coffee Lake has buttoned up the seemingly endless series of 4-core CPUs. All processors of the i7 series (including the high-performance 8700K), have 6 cores and 12 threads with various clock frequencies. CPUs of the i5 line-up feature 6 cores and 6 threads, while the affordable i3 processors have 4 cores and 4 threads. Thus, a major breakthrough has been achieved. Now, the Core i3 series can be considered analogous to the old i5, while the Core i7 series is the HEDT domain. The internal architecture of the Coffee Lake barely differs from the Kaby Lake, which, in turn, was similar to Skylake. It’s been quite a long time since Intel last chanced the architecture of its main range of CPUs. The L3 cache obtained additional 4 Mb for the sake of the 6 cores, and TDP grew to the level of 95 W. These changes appear to represent the entire range of improvements. In this processor, the performance boost is ensured by the clock frequency and the number of cores rather than architectural improvements. The same is true for the integrated graphics core. The only thing that has changed is its marketing name: UHD Graphics. Coffee Lake CPUs employ the UHD 630 graphics unit. In particular, the 8700K model works at a frequency of 1200 Mhz. Kaby Lake CPUs featured the same graphics core. It’s capabilities are more than sufficient for light gaming and viewing media files. If you’re looking for more, it’s advisable to purchase a discrete GPU. Taking into account the surging number of devices featuring nonvolatile memory, Intel could have increased the number of PCI lanes in the processors of its main line-up. But it didn’t happen. All Coffee Lake CPUs have only 16 PCIe 3.0 directly connected to the central processor, while the other 24 lanes on the motherboard function via a single DMI 3.0 (comparable to four PCI lanes). Actually, one GPU and one SSD are sufficient for most users. But the fact there are no additional memory slots is simply surprising, especially taking into account the separate four lanes going to the central processor in the Ryzen model. Despite the similarities of the Kaby Lake and Coffee Lake CPUs, the latter require a new set of microchips (Z370) that supports higher clock frequencies, has several M.2 slots and a multitude of input and output ports and connectors. 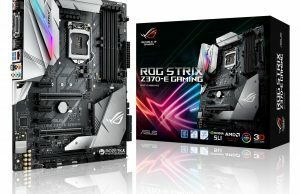 The company claims the new chipset is designed to allow for the stepped-up power consumption of the processor’s 6 cores, even though most Z270 motherboards have an excessively complex system of energy delivery. 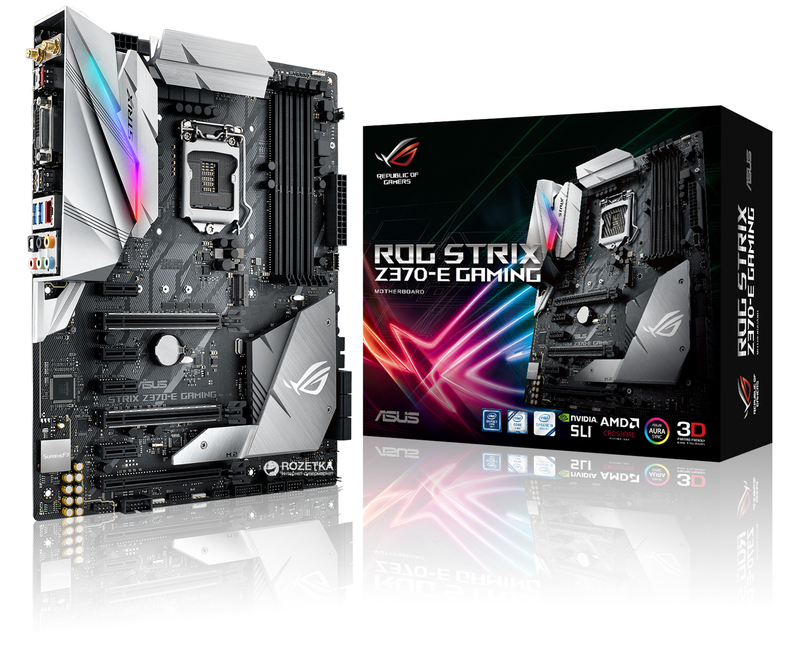 Worth noting, the 200-euro retail price of the Asus ROG Z370-E Gaming motherboard is completely justified. It’s fitted with two M.2 SSD slots (one of them is hidden beneath the microprocessor’s heat sink), three full-size PCIe 3.0 slots and four PCIe 1X slots; four DIMM slots supporting DDR4 memory with a speed of up to 4,000 MHz, USB 3.1 Gen 2; Intel I219-V gigabit Ethernet; Bluetooth 4.2; an 8-phase power supply and an 8-pin CPU connector. And, of course, there’s the complex ASUS ROG Audio system everyone loves so much. The motherboard looks very decent. It has options such as additional lighting, as well two connectors for external lanes and a fan. As always, the market offers a wide range of Z370 motherboards with only a 10-euro price difference. Unfortunately, only the expensive Z370 motherboards are widely available. The more affordable H and B series suit the standard clock frequency chips and the i3 products, but they will not hit the market until 2018. A buyer with a tighter budget has no other option but to wait. So, a Z370 motherboard supports higher clock frequencies, which makes it a perfect choice for the 8700K processor. However, unlike the previous-generation CPUs, the 8700K has achieved a greater clock frequency at the expense of reduced free space, even despite the advanced 14nm technology. The issue is not so much the fact the 8700K doesn’t reach a high clock speed. The problem is, at such a high frequency, the CPU consumes so much energy that it must be liquid-cooled or de-lided. Unlike the Ryzen processors, the 8700K’s heat distribution lid is attached with the help of a weak thermal interface material (TIM) rather than soldering. The 4-core CPUs neither need as much energy nor emit as much heat, so it’s not so dangerous to use a TIM. On the other hand, the 8700K does emit a huge amount of heat. At full load, it reaches a temperature as high as 90° C, while being fitted with a 280-mm water cooling system (in this case, it was CoolerMaster MasterLiquid Pro). I’ve also tried a 240-mm liquid cooling system, but it was unable to keep the Intel Core i7-8700K cool. The problem lies in the stepped-up load on the motherboard. In our configuration, it transfers about 1.248 V to the CPU to support its clock speed of 4.7 GHz. It’s much more that the 1.0 V consumed by 4-core processors. Indeed, if you lower the CPU’s clock frequency, the temperature drops without affecting the stability of its functioning. These indicators vary in different processors, but -0.090V has been determined as the optimal supply voltage reduction to drop the temperature below 75 °С. Apparently, the upcoming BIOS update will eliminate the auto setting issues; so far, I haven’t found another way to get rid of them. Like Kaby Lake, the Coffee Lake CPUs don’t perform well at a frequency of 5.0 GHz or higher, when the required voltage rises sharply. Of course, different processors have different reserves, but at a voltage of 1.33 V, I managed to reach a clock frequency of 5.0 GHz and a memory speed of 3,200 MHz. I used the 280-mm liquid cooler, and the temperature reached 86 degrees. It’s not recommended to exceed this indicator during your daily clock speed boosting. Undoubtedly, more advanced cooling systems will be capable of boosting the 8700K to 5.1 GHz at 1.36 V and 94 °С. Earlier, I criticized Intel’s TIM only in the expensive X-series processors. But it’s not difficult to employ more efficient heat transfer methods even in 6-core central processing units. Intel’s CPUs always fit well into various configurations, which is a great competitive advantage over the Ryzen processors. It would be a pity to discard such an advantage only because of the weak thermal interface material. As expected, the 6 cores perform excellently at a clock speed of 4.7 GHz (not to mention the 5 GHz frequency). Despite the lack of 2 cores in comparison with the Ryzen 1800X (which costs as much as £437), the 8700K processor manages to beat the Ryzen in terms of performance. It’s 11 seconds faster at clock frequency boosting and video processing. Only PovRay and Cinebench allow the 1800X to slightly exceed its competitor’s results. However, the price of the 8700K is closer to that of the Ryzen 1700 and 1700X, which allows you to save a lot of money. A boosted clock frequency is pretty much the only thing that differs the 8700K from the Ryzen CPUs. Worth noting, the 8700K produces a lot of noise during its normal operation. As expected, even the single-thread performance is very high (at 5.0 GHz, the 8700K processor exceeded the level of 220). However, when all the tested processors work at 3.5 GHz, the 7900X, 7740X, and 7700K demonstrate similar performance. This result is still higher than Ryzen’s. 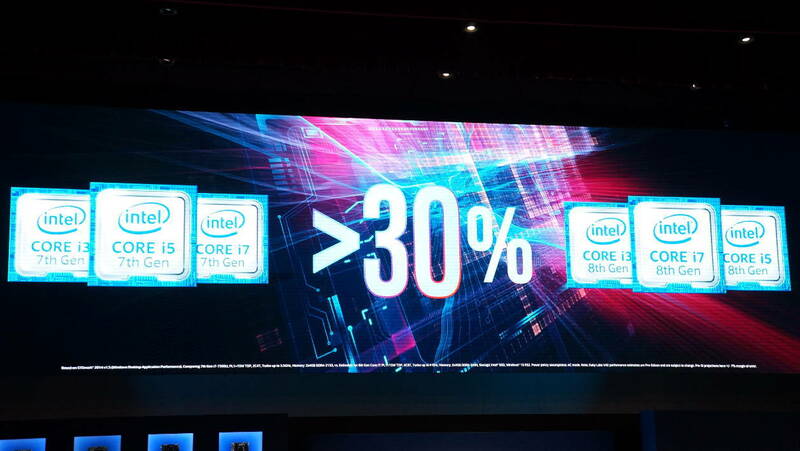 However, it shows that three CPU generations were not enough for Intel to improve performance beyond the clock frequency or the number of cores. The most interesting thing is how the 8700K and its additional cores work in real mode, especially in gaming. Coupled with the Nvidia GTX 1080 Ti, which is currently the most powerful GPU in the market, the 8700K demonstrates the highest performance among all CPUs I’ve ever tested. In Ashes of the Singularity, the 8700K processor reaches 107 FPS at 1080p, which is a 24% surge as compared to the 7700K’s result (86 FPS). A similar increase in performance is observed in all other games. When it comes to modern powerful processors, the main performance bottleneck is the GPU rather than the CPU. In 2018, several new powerful graphics cards will hit the market. But as of now, there’s no reason to replace a 7700K or a Ryzen processor with a more powerful one. 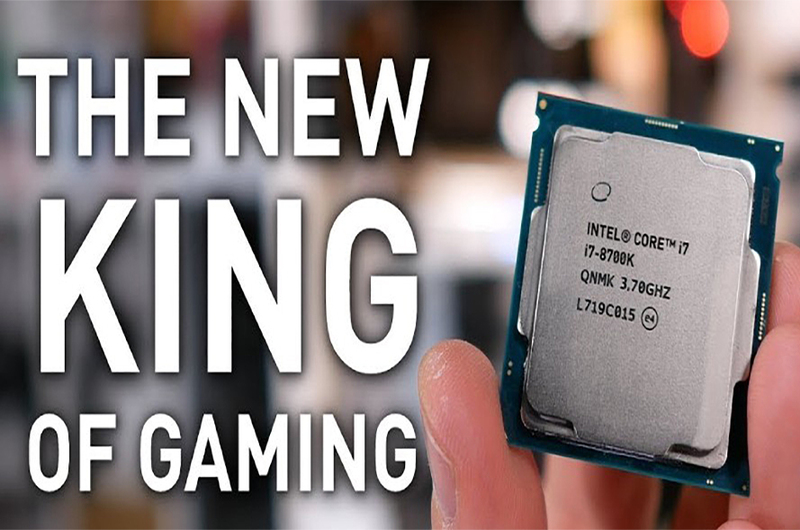 We can safely say that anyone stubbornly using the classic processors, such as the i7-2600K, should definitely switch to a newer CPU. After many years of perfection, the Coffee Lake obtained two additional cores and a major clock speed increase. This enables modern games and applications for media processing to work effectively not only on CPUs with 8 or more cores. Users who manage to utilize the additional threads available in the new processors save a lot of time when encoding video files and can run several applications simultaneously without any problems. 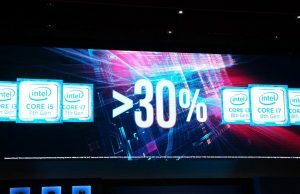 Intel’s approach lies in improving performance through adding cores and increasing the clock frequency, rather than changing the architecture, and it has proved worthy. The 8700K is one of the most successful processors for ultimate boosting. High-quality air coolers, such as the Noctua NH-D14, or 280-mm liquid coolers are quite sufficient to ensure its normal operation. If you’re going to boost the clock frequency beyond the standard range, it’s recommendable to use more powerful coolers. The possibility of achieving 5.0 GHz on all 6 cores is amazing, but if the Coffee Lake had a more efficient system for abstracting heat from the cores, the CPU could reach an even better performance level. Despite its tendency to overheat, the 8700K processor is definitely the best solution for gamers. Intel has made its move. Now, AMD is to accept the challenge. Most likely, by reducing the prices for its products. Let’s stock up on popcorn and wait for a new round in the competition of the two giants. * Intel must seriously consider refusing from the thermal interface in favor of soldering.